In 1595, Italian artist Bonaventura Salimbeni was commissioned to produce a painting for the right-hand altar of the Church of St. Peter at Montalcino, located within a few miles of Florence. He was a member of a prominent family of artists from nearby Siena, and the goal of his commission was that his work be completed for the Christian Jubilee Year of 1600. According to the message accompanying his signature, Salimbeni’s painting was finished right on schedule. What immediately catches the viewer’s attention, however, is something pictured in among the Trinity members that to modern eyes seems very familiar, but not from the right time period. The first impression is that it looks exactly like a spheroid satellite with two antennae, something akin to the old Russian sputniks or American vanguard orbiters of the late 1950s. But what is it actually supposed to be? Ventura di Archangelo Salimbeni (also later called Bevilacqua; 20 January 1568-1613 was an Italian Mannerist painter and printmaker and among the last representatives of a style influenced by the earlier Sienese School of Quattrocento-Renaissance. Salimbeni was born in Siena. He studied painting, together with his half-brother Francesco Vanni, under their father Arcangelo Salimbeni in his native Siena. At the Basilica della Santissima Annunziata di Firenze, he frescoed lunettes (1605-1608) illustrating events in the history of the Servite Order. In the Duomo di San Salvatore, he executed a magnificent John the Baptist. At about the same time, around 1600, he got an assignment in Assisi for a fresco of the “Resurrection of Christ” and the “Dying Saint Clare is visited by the pope” in the vault of chapel of San Massimo in the Basilica of Santa Maria degli Angeli. In 1595-1603 Salimbeni got the commission to paint frescoes with scenes from the church’s patron saints in the church of Quirico and Giulitta, one of the oldest churches in Siena. As in the church of Santa Trinità, he worked here alongside with the painter Alessandro Casolari. This was a period on non-stop new assignments : three paintings for the church San Lorenzo in San Pietro in Montalcino, the “Donation of the Keys”, the “The Glorification of the Eucharist (Disputa of the Eucharist)” and the “Crucifixion”. The most famous Montalcino art masterpiece is entitled “The Glorification of the Eucharist,” and features a vertical work divided into three segments. The lower third depicts a number of worshipping figures seated before the altar, including priests, cardinals and one individual wearing a papal crown believed to represent Pope Clement VII. The middle third shows the altar itself, and prominently displayed in its center is the Cup of the Eucharist emblazoned in glowing light. The upper third of the painting symbolizes heaven, dominated by the three Beings of the Holy Trinity who are looking down on the earthly scene below and giving their blessings—God the Father depicted as a Moses-like bearded old man, God the Son as Jesus Christ, and the Holy Spirit portrayed as a Dove hovering above the center. While the trinity members is holding each of the antennae with one of their hand. The antennae itself is attached into a sphere object. Renaissance art experts interpret the strange sphere as representing the universe, showing the faint lines of celestial longitude and latitude, plus the images of an obscure sun and an exaggerated crescent moon shining from inside. The two “antennae”— one held by God the Father and the other by God the Son—are said to be “scepters” symbolizing divine rulership. But the closer one examines the object, the more inconsistencies arise with this somewhat limited interpretation. If the “sphere” is supposed to be the universe, why are there no stars or constellations depicted shining from inside it? In fact, there is nothing transparent about it—the sphere on the contrary appears to be solid, with what looks like a metallic sheen reflected off its exterior. The so-called celestial “lines” more realistically suggest the seams of metal plating that covers the outer circumference, made of a strange blue-black material. The “sun” is too indistinct to represent the solar body, and in a technological context more likely is an electrical light source designed to illuminate the sphere’s immediate surroundings. As for the “moon,” its unnatural double crescent with touching ends was not meant to depict a flat circle in two dimensions, but forms the edge of a three-dimensional narrow-width cylinder seen from an angle— what we today would identify as a camera lens protruding off the sphere’s surface. Without a doubt the most outlandish features are the two “antennae.” They bear no resemblance whatsoever to any type of “scepter” or staff of power used by Renaissance officials, political or religious. Usually a scepter is pointed at the bottom end and has some symbol or figure prominently displayed at its apex. In contrast, the two objects held by the Trinity members are slightly wider at their bases than their tops. In fact, on much closer inspection, it can be clearly seen that both objects have an inherent “telescoping” design. They are segmented into distinct sections which could be collapsed into a smaller size, and when pulled apart would extend to greater lengths. The problem is, “telescoping” was a mechanical innovation which was not invented until the early eighteenth century. What is it doing being portrayed in a painting over a hundred years too soon? Even stranger, it can be observed that the two antennae are fastened to the sphere with gold or brass-colored grommet-rings, and certain lengths of the antennae also have grommet-rings. A grommet-ring is a threaded eyelet that is used to tighten and hold metal segments in place. Once again, we are dealing with something from another time, for such an innovation did not appear in industrial machinery design until the mid-nineteenth century. And then there is the anomaly of the antennae themselves. The existence of antennae for the earliest radio transmissions did not appear until the first part of the twentieth century. 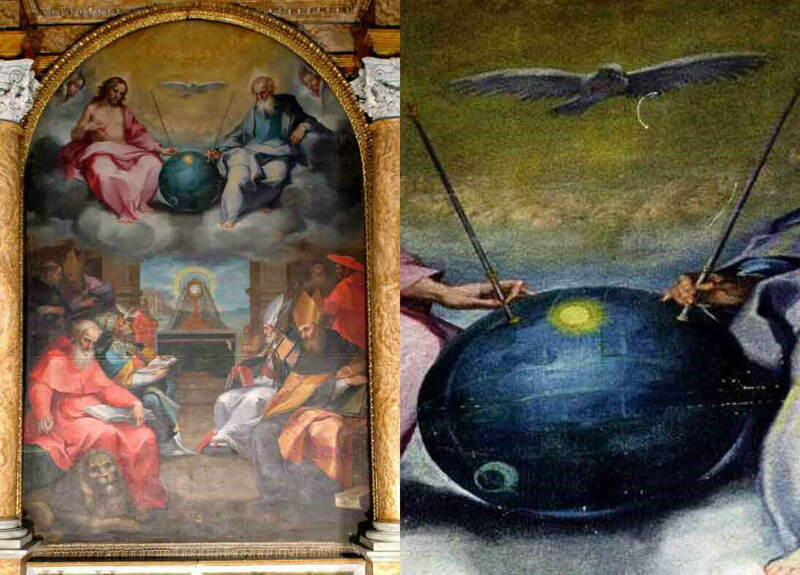 Going a step beyond, it can also be noticed that the sphere is clearly depicted as not resting on the background cloud it is pictured with, or sits on any surface whatsoever, but is hovering in place, held up by the “invisible powers” of the Trinity. Also, the sphere casts no well-defined shadow, which means that it did not appear in the physical but was more likely seen as a projected image. Ufologists and “ancient astronaut” theorists have been quick to seize upon this out-of- place object as being proof of an extraterrestrial visitation, possibly a spaceship seen by the artist. The problem is, there is nothing especially “alien” about this device. In fact, every one of its aspects is recognizable as the product of a purely earth-bound technology. The real mystery is not one of place but one of time. The sudden appearance of something displaying elements of a futuristic technology in the sixteenth century strongly suggests that this is ultimately where it must have come from, the future. Either that, or it was a projection far forward from a lost advanced civilization long disappeared that developed along technological lines not that much different from our own today. The questions remain, what exactly did the artist see, and why did he portray it in the manner shown in his painting? Undoubtedly, Salimbeni regarded his encounter as a God-given vision, and through his artistry sought to comprehend it in that context. The device could have suddenly and unexpectedly appeared before him as if out of thin air, then quickly vanished after only a few seconds. But having an artistic eye sensitive to details, he very likely immediately made sketches of what he saw so he could later better remember it and portray it in the larger and more permanent masterpiece work we see today.